Hemsworth MW defied playing with 10 men for 72 minutes following a controversial sending-off as they battled to an outstanding 1-0 win over a Bridlington Town team that started the day ahead of them in the Toolstation NCE Premier table. The victory, courtesy of a single goal scored by Richard Collier when they had their full compliment of players, lifted Welfare back up to third place in the table as they look to finish as high up the table as they can. Midweek results had seen Wells slip down to fifth place, but they made a good start against a Brid team two points above them before kick-off. They could have been ahead in the fifth minute when Luke Danville came up from the back to get his head to a corner. His knock down was met by Bradley Dockerty, but he could only send the ball over. Collier then had a free-kick comfortably saved, but the Town keeper could not prevent him from opening the scoring in the 16th minute when another free-kick from distance this time was hit with more power. 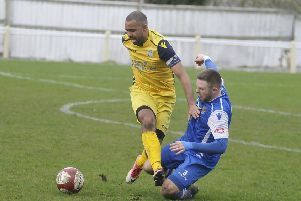 Hemsworth’s joy was shortlived as two minutes later they went down to 10 men with club captain Danville shown a straight red card – a decision described as “awful” by Wells boss Wayne Benn. The manager reshaped his team to play with a man short and the players responded by working hard to prevent the visitors from creating much for the rest of the first half. Wells were also short of opportunities although Dockerty sent a header wide. More rejigging was needed early in the second half when the hosts lost substitute Andy Higgins to injury, but they continued to cope and defended heroically as Brid exerted a strong spell of pressure. The closest the visitors came to a goal was with a header that was cleared off the line by Collier. Wells managed to create a big opportunity when Adam Wilson’s volley was blocked and Dockerty’s follow-up effort was cleared off the line. Dockerty raced through to be one-on-one with the keeper only to be denied and moments later he fired in a shot that forced another save. Brid tried to hit back in the closing stages, but Hemsworth held out for a win that manager Benn felt was well deserved. He said: “I’m thrilled with my players. “Because of an awful decision by the officials we have had to play 70 minutes with 10 men against a very good side and we have thoroughly deserved the win and a big three points. “The character we have shown, the effort we have put in and the togetherness of the team has got us through. “But actually Jordan (Greaves) in goal has had very little to do and that’s testament to the players in front of him. Benn added: “We have beaten a good side, but the battle continues as we have other tough games coming up and ground to make up on Penistone. We certainly aren’t discounting any team in the top six so it should be an exciting end to the season. Hemsworth now face their first away game for a month at Knaresborough Town this Saturday. They also host Albion Sports next Tuesday.